An Aquaman spin-off is in the works at Warner Bros. 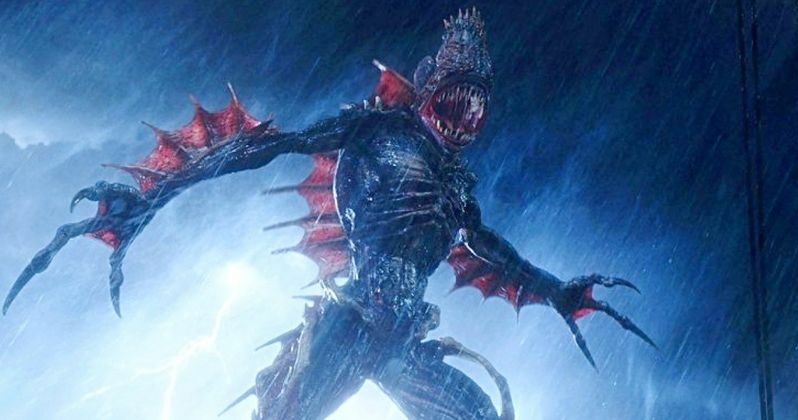 This movie, however, will never be centered on the King of Atlantis or any of the other major characters we met in director James Wan's blockbuster DC Comics adaptation. Instead, this project will focus on the hideous creatures and the kingdom known as The Trench who were featured in one of the movie's large action set pieces. According to a new report, Warner Bros. has commissioned a script for The Trench from newcomer writers Noah Gardner and Aidan Fitzgerald. The story is said to have a horror theme to it. Given the scene in question from Aquaman, which sees Jason Momoa's Arthur Curry and Amber Heard's Mera fighting for their lives against an army of these ravenous monsters, that makes a great deal of sense. Beyond that, few details have been revealed, but it's a move that makes sense for several key reasons. Not the least of which has to do with the studio wanting to try and further profit from the success of their most recent DC outing. For starters, Aquaman is now the highest-grossing DC movie ever, having taken in $1.1 billion at the global box office. Not only that, but James Wan, who will serve as a producer on The Trench, is one of the biggest and most respected names in horror, having directed both of The Conjuring movies, in addition to the first Saw and Insidious movies. So getting him on board to produce a spin-off, that is very much in his wheelhouse, related to one of the biggest box office hits of recent memory? That seems like a possible home run. The Trench are actually a relatively new addition to the world of DC. They were initially introduced in 2011 as part of the publisher's New 52 relaunch. They were introduced in the Aquaman solo title and were created by Geoff Johns. The monsters were originally part of the kingdom of Atlantis. However, when it sunk, those who were cut off from the society eventually evolved into the terrifying beasts seen on screen. The story of the spin-off will actually take place in the kingdom occupied by The Trench. It reportedly won't feature any of the main cast from Aquaman. Warner Bros. is also in very early discussions for Aquaman 2, but they don't seem eager to rush it. This project, meanwhile, will have a much more modest budget than the usual comic book movie, which could also help make it a success. At the present time, there is no word on casting or who could end up directing. As for Noah Gardner and Aidan Fitzgerald, they were previously assistants to J.J. Abrams at his Bad Robot production company. This could represent a major break for them. We'll be sure to keep you posted as further details on the project are made available. This news was first reported by The Hollywood Reporter.